The vibrant green slopes called Puakea, in the District of Kohala in the northern tip of the Island of Hawai`i, have drawn people to them from the time of the early Hawaiians creating a rich and still vibrant multi-cultural history. The first immigrants to arrive were Polynesians from the Marquesas Islands. They built one of the state’s oldest structures, Kukuipahu Heiau, c. 600, a temple just a short hike south of Puakea. Turing north for a short hike is the Mo`okini Luakini Heiau that, according to a family chant, was built around 480 AD (perhaps by Hawai`i’s indigenous folk) and was dedicated to the god of war, Ku. It was transformed into a luakini or sacrificial temple in the 11th century by Pa`au, a kahuna-chief who arrived from the Society Island in the second migration to hit the island. Mo`okini Luakini provided the platform for Pa`au to enforce his kapu (taboo) system of governance used by Hawaiian chiefs until 1819. Within site of Mo`okini is Kamehameha Akahi Aina Hanau, the birthplace of Kamehameha the Great, who is said to have been born here in 1758 as Halley’s Comet passed overhead. Kamehameha’s life was an astonishing blend of Moses, King Arthur, and Greek drama. Kamehameha was the first to unite the islands of Hawai`i and rule as king until his death in 1817. A number of surrounding state and national historical sites honor his life, his battles, and the men who served him. The fertile land of Puakea’s was part of the Kohala Field System – thought to be an 8th Wonder of the World by early explorers for its ingenuity and efficiency in maximizing rainfall and preventing soil erosion by terracing the land at intervals mirroring its slope. The system was developed as early as 1000 and lasted for several centuries into the 1800s. Evidence of early Hawaiian communities is still easily found at Puakea. Ancient dry stack rock walls surround the entire 33-acre estate. Monolithic lava boulders are set in straight lines up the gently sloping land where they have rested, in the sun and winds of Kohala undisturbed for hundreds of years. In 1848, Kamehameha III enacted the Great Mahele and all Hawai`i’s land was divided among the king (crown lands), chiefs, and the commoners. The Kuleana Bill passed two years later introduced the concept of land ownership. As a fertile and beautiful place, Puakea was set-aside as crown lands and was held by Kamehameha I’s granddaughter, Kekauonohi until 1870 when it was acquired by Dr. James Wight. Dr. Wight had arrived in North Kohala in 1850 by a circuitous route – he was born in India in 1814, educated in Scotland and was on his way from Australia to the gold fields of California with his family when their ship wrecked on North Kohala’s shores. Wight became an influential community leader, serving as postmaster, circuit judge, representative to the territorial government and a member of the house of nobles. He had initially established a store with a pharmacy, and then turned his business interest to Hawai`i’s emerging sugar and cattle industries as land became available. At Puakea, Wight built the first animal mill on the island of Honolulu to process sugar and began raising cattle. When he died in 1905 at the age of 91, his legacy as a sugar baron and rancher was augmented with his efforts in the field of horticulture as one of the first to import orchids from England and ironwood trees from Australia. After her father’s death, Wight’s daughter Clara and her husband Howard Rattenbury Bryant continued the cultivation of sugar cane at Puakea until 1930 when the last crop was milled and the operation closed. The sugar mill Wight had built was found on Oahu and is available at a price. The mill’s stack was still standing until November 5 when an earthquake hit North Kohola. Evidence can still be found of the historic railway system that transported sugar to the harbor at Mahukona. 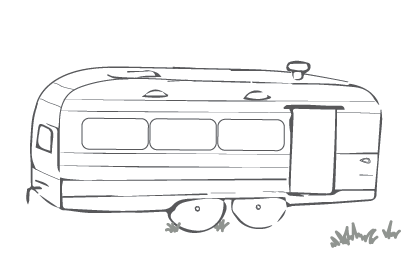 Meanwhile, as the chapter was closing on Puakea’s sugar operation the ranching side of the Wight enterprise was being embraced by a nisei, a ‘second generation’ Japanese immigrant. Zenjiro Kawamoto and his wife Wasa Watabayashi were two of the nearly 185,000 Japanese who came to Hawai`i between 1885 and 1924 to work in the sugar industry. 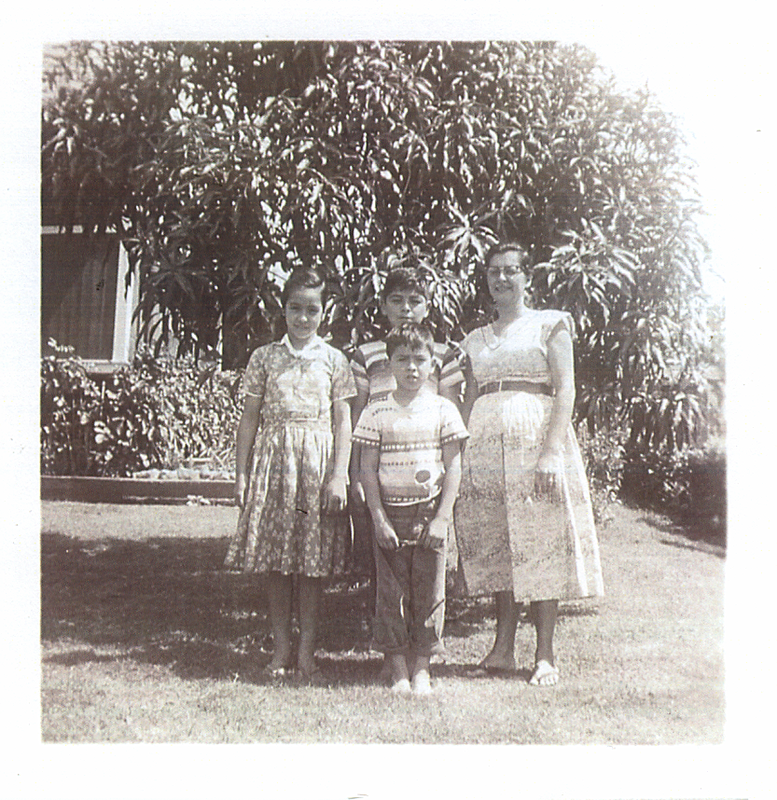 They worked and lived at Puakea and their son Masato (Johnny) Kawamoto was born and raised there. Young Johnny grew up on the ranching side of the Wright enterprise and took on the cowboy role with enthusiasm. Ranching is one of the longest-sustained industries in Hawai`i, beginning in 1793 with the introduction of cattle as a food source for crews on passing ships. The longhorn cattle multiplied fast and created havoc to early Hawaiians who had never seen an animal bigger than a pig. 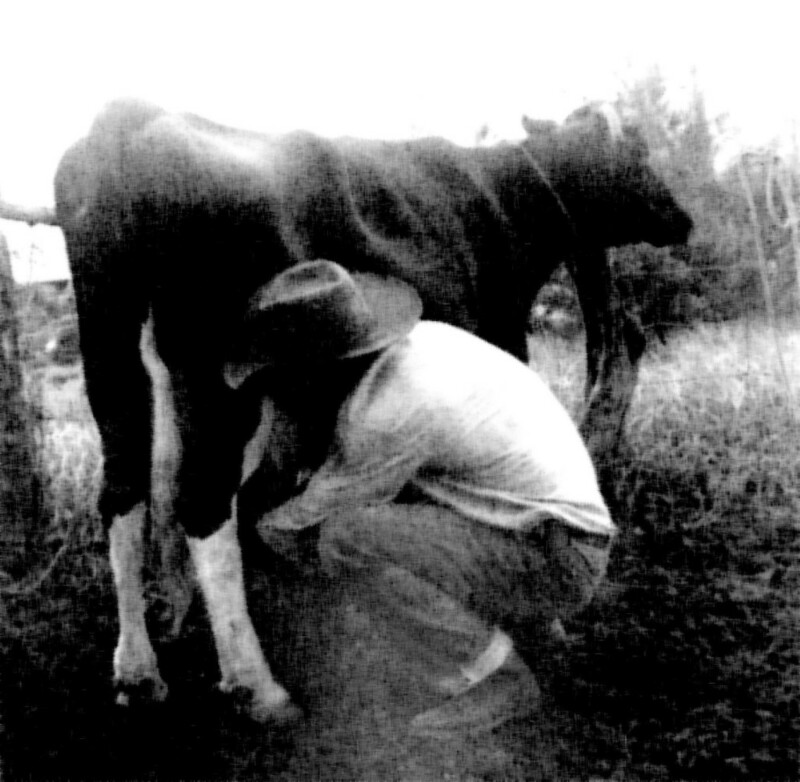 To cope with the strays, Vaqueros, of Mexican, Indian, and Spanish decent, immigrated to Hawai`i to teach cattle handling techniques and leather working skills. Cowpokes became known as paniolo (extracted from Espaniolo) fifty years before the cowboy culture of mainland’s Old West. Hawai`i’s paniolo history is a rich multi-ethnic story of hard work in rugged conditions, ingenuity, perseverance, love and respect for the land. When Kohala-born paniolo Ikua Purdy was proclaimed the world rodeo steer-roping champion in 1908, it placed Hawai`i on the cowboy map. Today, these same values are nurtured within the rural ranching lifestyle that is so much a part of the state. 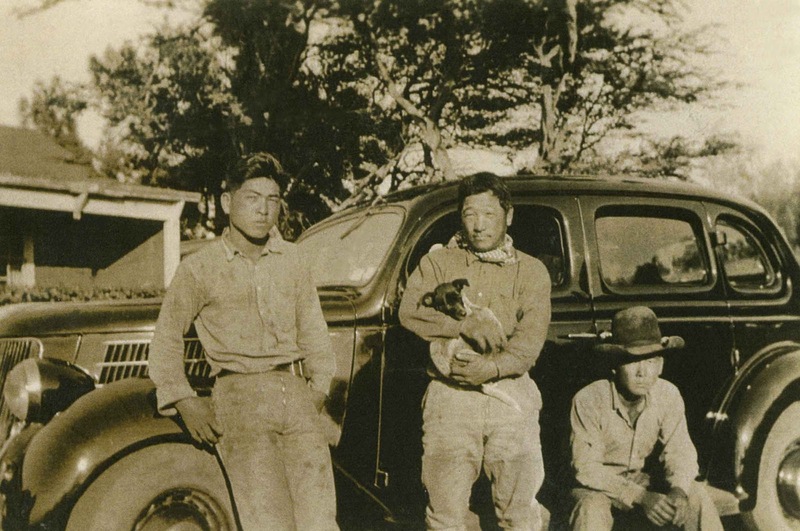 When Zenjiro retired in 1922 almost all the James Wight Estate’s operations were focused on livestock production, and son Johnny, a 20-year-old ranch hand, was ready to assume many of the responsibilities. 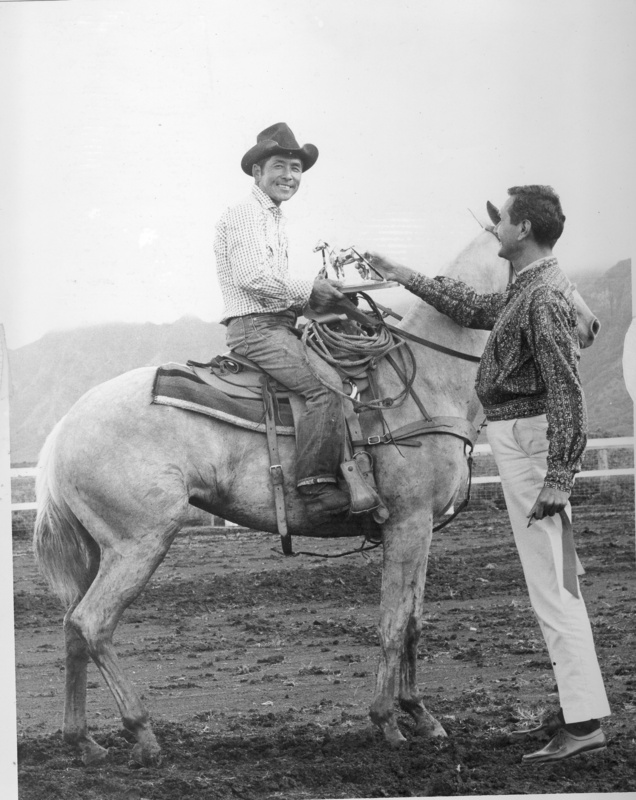 Johnny’s enthusiasm carried down through four generations of Kawamoto cowboys who lived and worked at Puakea. 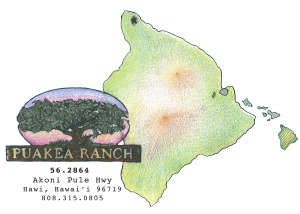 For many years, Parker Ranch, headquartered in South Kohala leased the lands from the Estate and finally purchased the ranch in 1944 – keeping the Kawamoto clan in place to oversee operations. 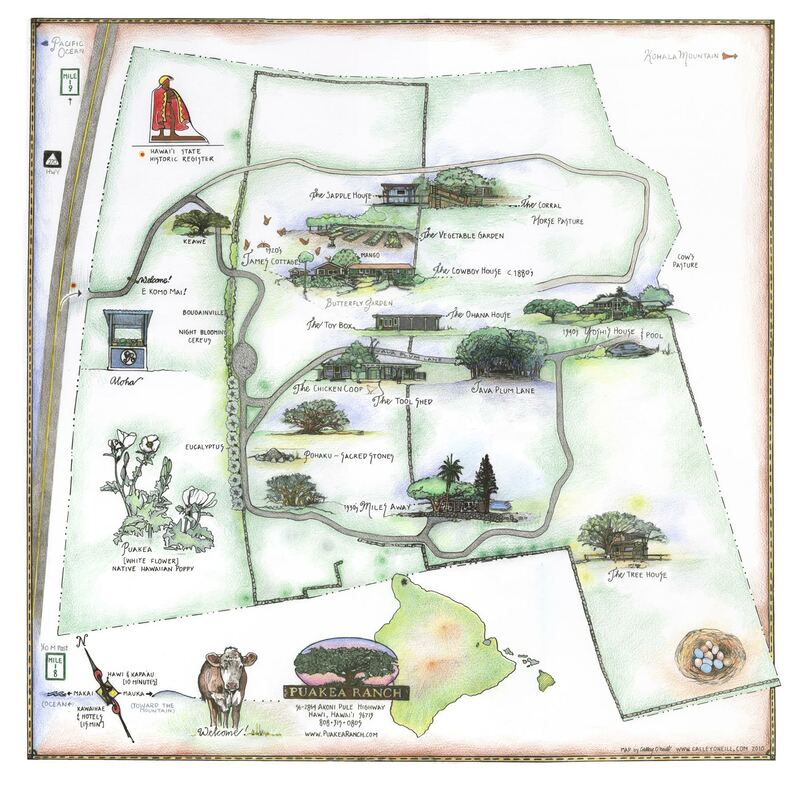 In 2002, Parker Ranch sold 200+ acres of Puakea and surrounding lands to a local developer who subdivided the acreage following the original rock walls as property boundaries. Sadly, the Kawamoto Family and the others who had lived on the land and worked for Parker Ranch for many decades were asked to find other homes, marking the end of a rich era. Local residents rented out the small homes from the developer, but the ranching and farming activity no longer existed. Masa Kawamoto The King of the Cowboy’s” being congratulated by Richard Smart, owner of Parker Ranch. Yoshi, Johny and Massa at Puakea. This picture was taken in front of Cowboy House.